The GLBT Historical Society Museum, located in the heart of San Francisco’s Castro District, is the first full-scale, stand-alone museum of gay, lesbian, bisexual, and transgender history and culture in the United States. At 1,600 square feet (150 square meters), the museum, while small, packs a powerful punch, celebrating the city’s vast queer past through dynamic and surprising exhibitions and programming. Open since January 2011, the museum showcases the sheer depth and breadth of the GLBT Historical Society’s archives, demonstrates the importance of queer history to the public, and mounts wide-ranging exhibitions with an emphasis on diversity and social justice. The museum contains three gallery spaces for exhibitions. 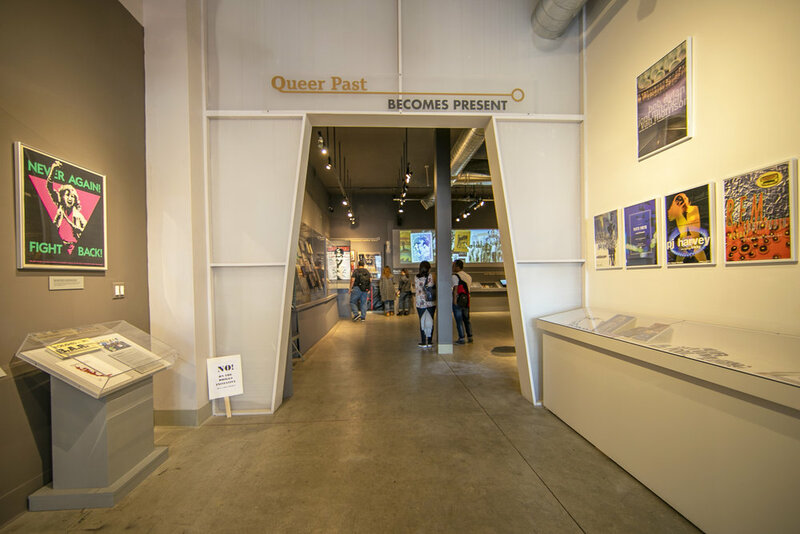 Our powerful Main Gallery exhibition, “Queer Past Becomes Present,” documents the queer presence in the Bay Area from as far back as the Spanish explorers and missionaries to the present and features rich multimedia drawn from our archival collections. Our two other galleries, the Front Gallery and the Community Gallery, are dedicated to rotating exhibitions on a range of themes. Monday - Saturday: 11:00 a.m. to 6:00 p.m.
Museum Closures: May 6, May 27 (Memorial Day), May 28. Admission is free for all visitors on the first Wednesday of every month, thanks to a grant from the Bob Ross Foundation. Docent-led tours are available by appointment for groups of 10 or more. To book a tour, contact our Program Manager, Nalini Elias. Tours must be scheduled at least four weeks in advance and are subject to docent availability. Books. Mugs. Pins. Shirts. Postcards. And more! A piece of queer-related history is always a perfect gift for yourself or your loved ones. We also have an online shop offering our fabulous queer history-themed products. We maintain our museum with generous help from foundations, business sponsors, individual donors and volunteers. You can support the museum by arranging a sponsorship, contributing to our Annual Fund, signing on as a volunteer — or all three! Windows for Harvey takes place from May 17 through May 26, 2019. The GLBT Historical Society’s exhibit is called “What Would Harvey Do?” and is designed by John Raines. At a kiosk in the museum and on this web page, visitors may respond to the question, “If Harvey Milk were an activist today, what issues do you think he would be taking on?” Responses will be shown on the museum video wall and be updated daily. The kiosk and web page will launch on May 1 to collect responses but they will not be displayed until May 17. The museum is located a half-block west of the intersection of Castro and 18th Streets in San Francisco’s Castro District. By Muni: Via the Muni Metro, take Lines K, L or M to Castro Station, then walk one block south to 18th Street. Via other Muni lines, streetcar line F and buses 24, 33 and 35 all stop within a block of the museum. By car: Metered street and lot parking is available, but may be difficult.